” The answer to obesity will never be in telling people what to do, guilting them for making unhealthier choices in a confusing consumption landscape, or by simply banning things. We also know that education and knowledge will get us only so far. The real answers lie not even in inspiring populations to make hundreds of healthier decisions each and every day in the face of a seductively obesogenic, social milieu. If we are to drive long‐term, sustained and scalable change, we must tweak the system to ensure those healthier choices become the path of least resistance—and eventually preferred. And I believe we must focus, initially, on our kids. 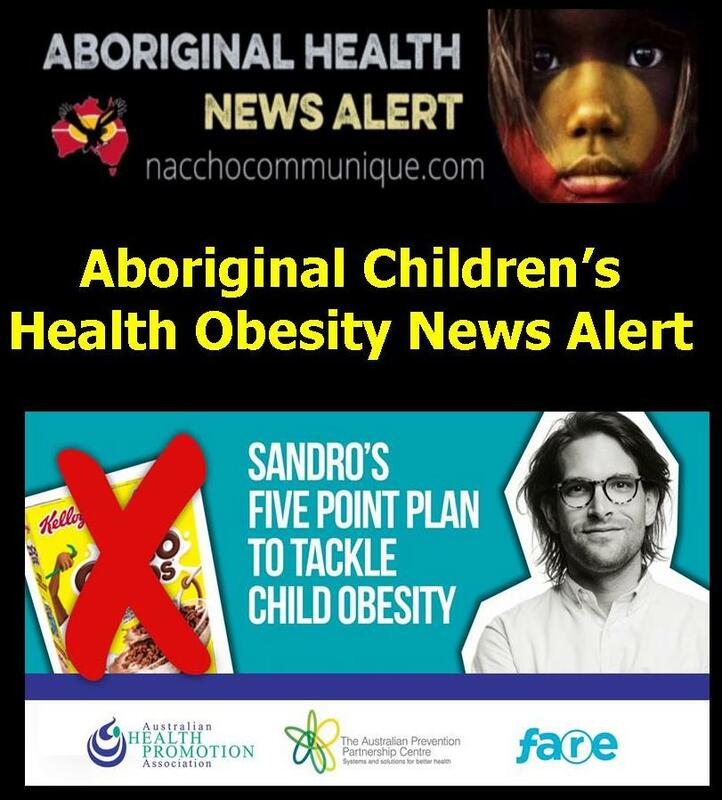 ” The 2012-13 Health Survey identified that Indigenous adults were 1.6 times as likely to be obese as non-Indigenous Australians, with the prevalence increasing more rapidly in Aboriginal school-aged children. Overweight and obesity in childhood are important predictors of adult adiposity, increasing the risk of developing a range of medical conditions, each of which is a major cause of morbidity, mortality and health expenditure. While it is surprisingly clear what needs to be done to improve the health of Indigenous children, recent cuts to Indigenous preventative workforce and nutrition programs throughout Australia have severely reduced the capacity to respond. 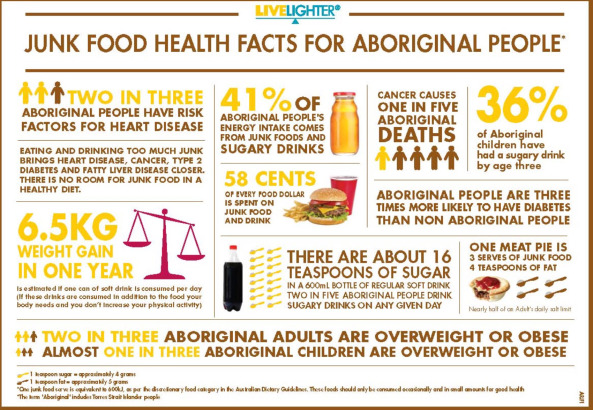 Comprehensive primary health care is a key strategy for improving the health of Indigenous Australians and is an important platform from which to address complex health and social issues associated with obesity. Closing the Gap, including the gap attributable to obesity, requires ensuring the ACCHS sector is resourced to deliver the full range of core services required under a comprehensive and culturally safe model of primary health care. Extract from NACCHO Network Submission to the Select Committee’s Obesity Epidemic in Australia Inquiry. Compelling populations, individuals or even ourselves to act pre‐emptively on the urgent and massive challenges of tomorrow is notoriously difficult. The concept is called temporal or future discounting, and it is well documented.1 It is the idea that we prioritise our current comfort and happiness over our future and seemingly distant safety or wellbeing. This psychological shortcoming plays out in many ways. At the micro level, we may defer until next week what we should do today—that run, drinking more water or the dentist check‐up—as it may not reap benefits for months, or ever. Eventually, we may act on some of these but whether delayed, deferred or denied, it can reap serious health consequences. At the macro level, it becomes even more problematic. When we combine this “delay what’s beyond tomorrow” phenomenon with short‐term political cycles in the context of systems‐based, slowly evolving and largely invisible future threats, important but not yet imminent issues are not just postponed, but ignored. Few challenges are a greater threat to the health of Australians, nor better define future discounting, than obesity. At the individual level and in our modern, obesogenic societies, weight gain has become the norm—the biological and social path of least resistance. 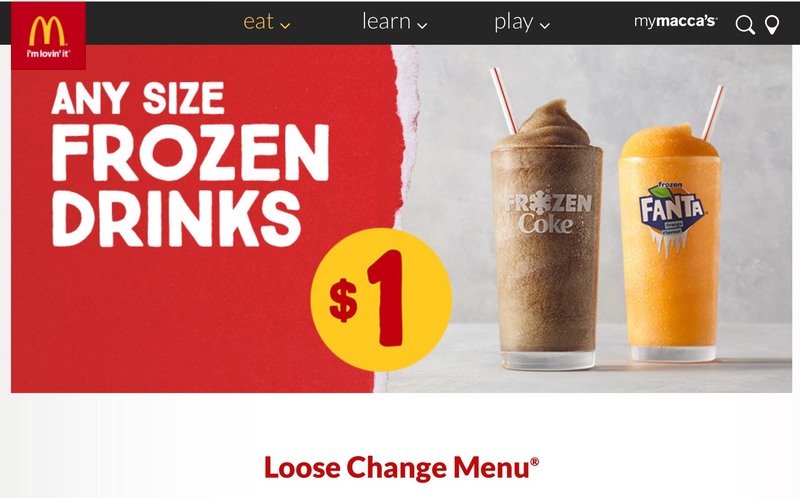 Food systems have shifted from a focus on seasonal, fresh and relatively calorie‐poor staples with minimal processing or meat, to an environment where junk foods and processed foods are ubiquitous, heavily advertised, hugely profitable and, for many communities, the only feasible “choice”. At the policy level, a dangerous, pernicious and unhealthy status quo has evolved over decades. One which sees a population increasingly affected by preventable, chronic disease. One which can only be solved through difficult decisions from politicians and the public to make the short‐term, passive but unhealthy comfort harder; and the long‐term promise of wellbeing more attractive. One which must see sustained public demand and political commitment for a distant goal and best scenario of nil‐effect, in the face of constant, coordinated and powerful pushback, threats and careful intimidation from largely unprecedented policy counter‐currents. But opportunities do exist; levers throughout this gridlocked policy landscape that can be utilised to move the obesity agenda forward. One of those is our kids. We know that if we cannot prevent obesity in our children, those young Australians will likely never achieve wellbeing. Recent evidence suggests early, simple interventions not only reduce weight and improve the health for our youngest kids, but also reduce weight in their parents.7, 8 An important network of effective implementation platforms and primed partners already exist in our schools and teachers around the nation. Finally, a large (but likely overstated) proportion of Australians may call “nanny state” at even the whiff of effective policies against obesity, but less so if those policies are aimed at our children. 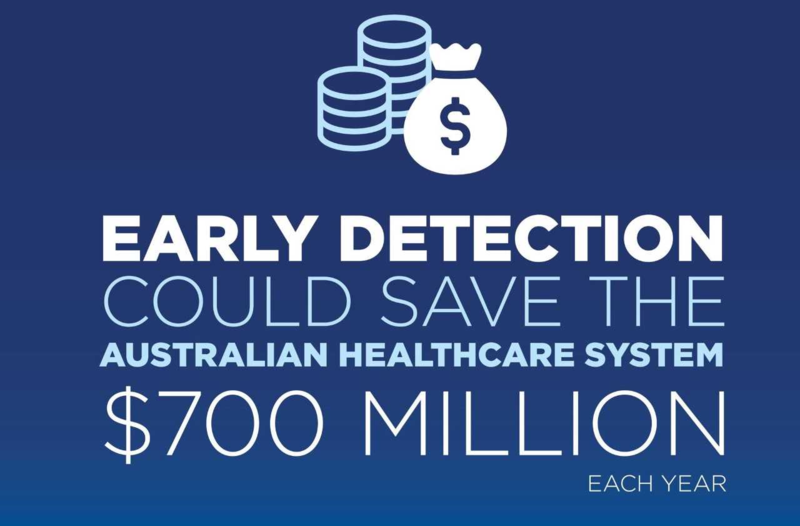 With this in mind, I was recently invited to Canberra to present on how I would spend an extra $100 million each year on preventive health for the nation. This is the five‐point policy plan I proposed; a lifeSPANS approach to addressing child obesity—and with it, equipping a new generation of Australians to act on tomorrow’s risks, today. This is an evidence‐based package to reduce the major sources of premature deaths, starting early. Schools alone cannot solve the child obesity epidemic; however, it is unlikely that child obesity rates can be reversed without strong school‐based policies to support healthy eating and physical activity. Children and adolescents consume 19%‐50% of daily calories at school and spend more time there than in any other environment away from home.11 Evidence suggests that “incentives” are unlikely to result in behaviour change but peer pressure might.12 Therefore, learning among friends offers a unique opportunity to positively influence healthy habits. School vending machines or canteens selling sugary drinks and junk foods further fuel an obesogenic, modern food environment. 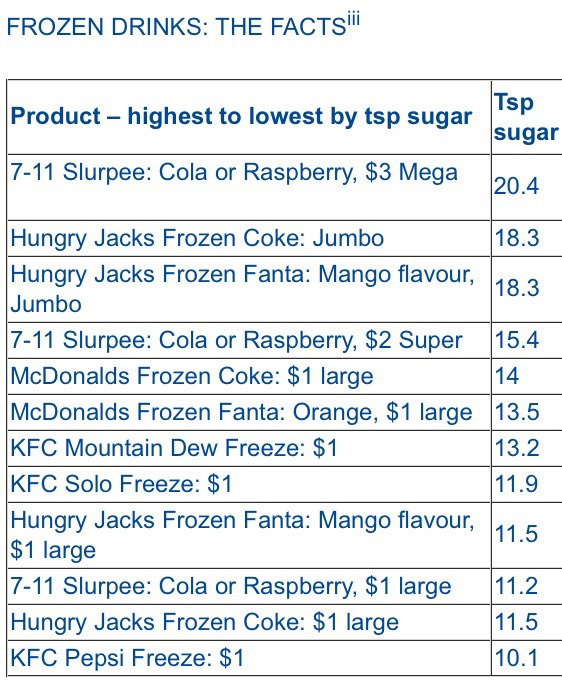 Sugary drinks are the leading source of added sugar in our diet in Australia and are considered a major individual risk factor for non‐communicable diseases, such as type 2 diabetes.13 Removing unhealthy foods and drinks from schools would support children, teachers and parents and send a powerful message to communities about the health harms of these products. Finally, it is not only about taking things away but also supporting locally driven programs and the school infrastructure to support healthier habits. Drinking fountains, play equipment and canteen hardware could all be supported through small grants aimed at further empowering schools as decisions makers and agents for healthier kids. 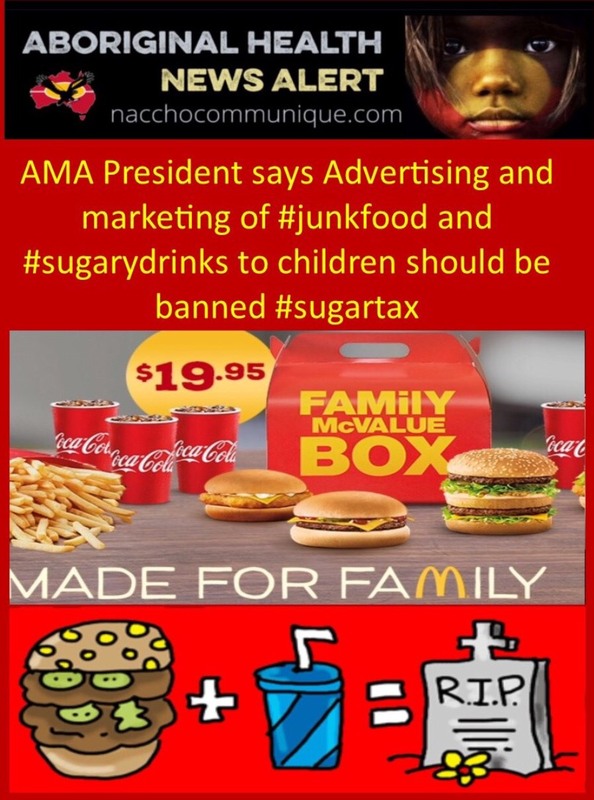 Ending junk food advertising to children, including any use of cartoons in the advertisement of food and drinks, is an important step to support our kids. Efforts should be made to strengthen the usability of existing efforts and make consistent, evidence‐based and effective labelling mandatory. Such developments would also provide stronger incentives for manufacturers to reformulate products, reducing sugar, fat and salt content. Clearer and consistent information would help create a more enabling food environment for families to make informed choices about their food. Dr Alessandro Demaio, or Sandro, trained and worked as a medical doctor at The Alfred Hospital in Australia. While practicing as a doctor he completed a Master in Public Health including fieldwork to prevent diabetes through Buddhist Wats in Cambodia. In 2010, he relocated to Denmark where he completed a PhD with the University of Copenhagen, focusing on non-communicable diseases. His doctoral research was based in Mongolia, working with the Ministry of Health. He designed, led and reported a national epidemiological survey, sampling more than 3500 households. Sandro held a Postdoctoral Fellowship at Harvard Medical School from 2013 to 2015, and was assistant professor and course director in global health at the Copenhagen School of Global Health, in Denmark. He established and led the PLOS blog Global Health, and served on the founding Advisory Board of the EAT Foundation: the global, multi-stakeholder platform for food, health and environmental sustainability. To date, he has authored over 23 scientific publications and more than 85 articles and blogs. In his pro bono work, Dr Demaio co-founded NCDFREE, a global social movement against noncommunicable diseases using social media, short film and leadership events – crowdfunded, it reached more than 2.5 million people in its first 18 months. Then, in 2015, he founded festival21, assembling and leading a team of knowledge leaders in staging a massive and unprecedented, free celebration of community, food, culture and future in his hometown Melbourne. In November 2015, Sandro joined the Department of Nutrition for Health and Development at the World Health Organization’s global headquarters, as Medical Officer for noncommunicable conditions and nutrition. From 2017, he is also co-host of the ABC television show Ask the Doctor – an innovative and exploratory factual medical series broadcasting weekly across Australia. Sandro is currently fascinated by systems-innovation and leadership; impact in a post-democracy; and the commercial determinants of disease. He also loves to cook. 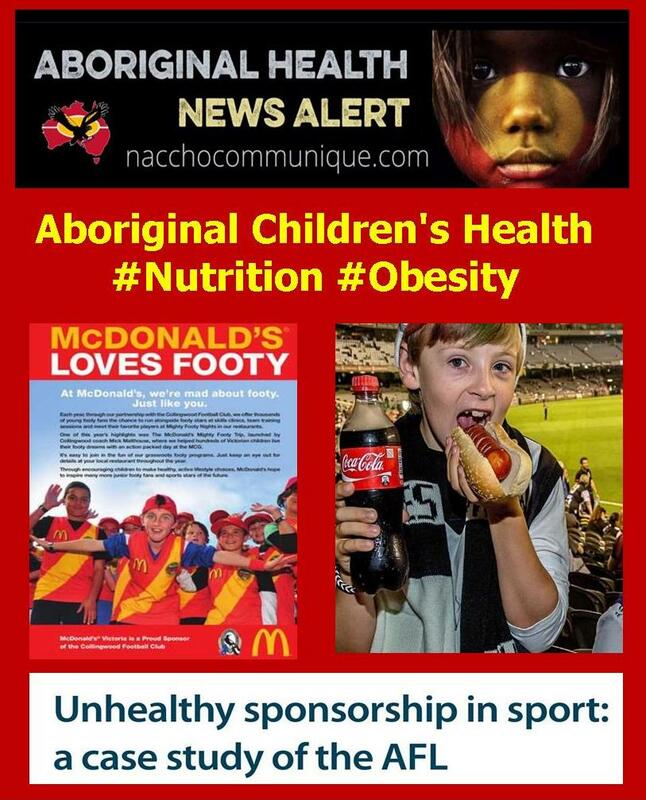 “Aboriginal and Non- Aboriginal kids are being inundated with the advertising of alcohol, junk food and gambling through AFL sponsorship deals according to a new study. 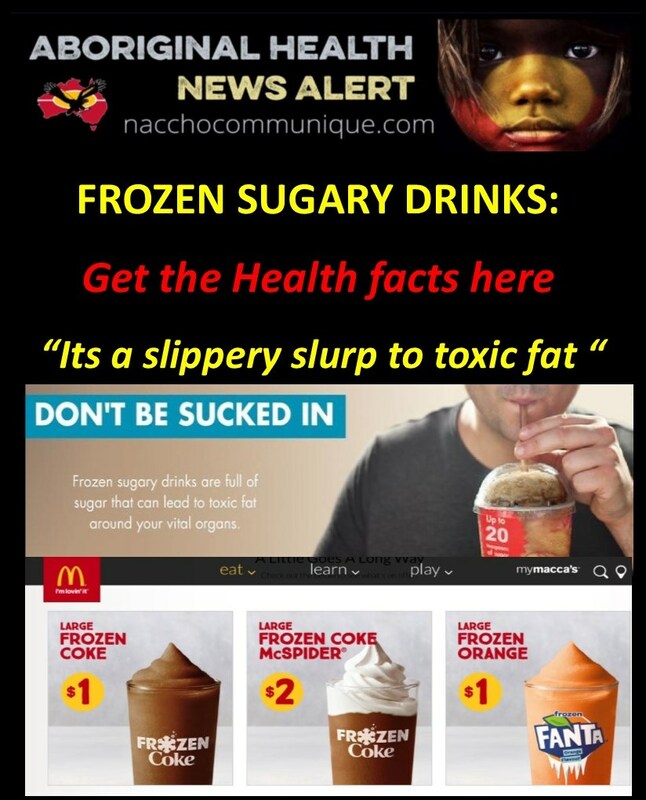 Says the Public Health Association of Australia (PHAA). 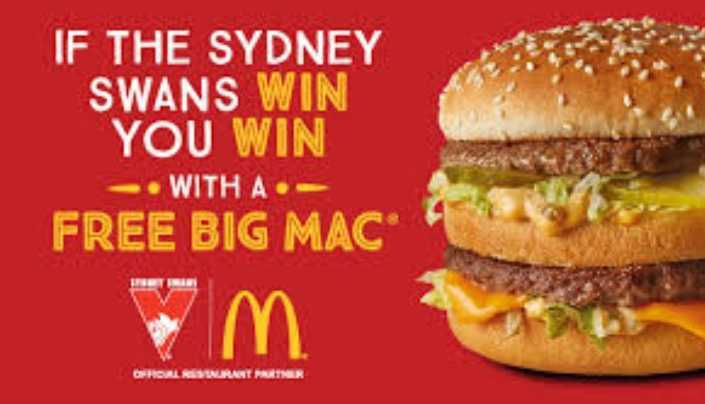 In the study published this week in the Australian and New Zealand Journal of Public Health, Australian researchers looked at the prevalence of sponsorship by alcohol, junk food and gambling companies on AFL club websites and on AFL player uniforms. 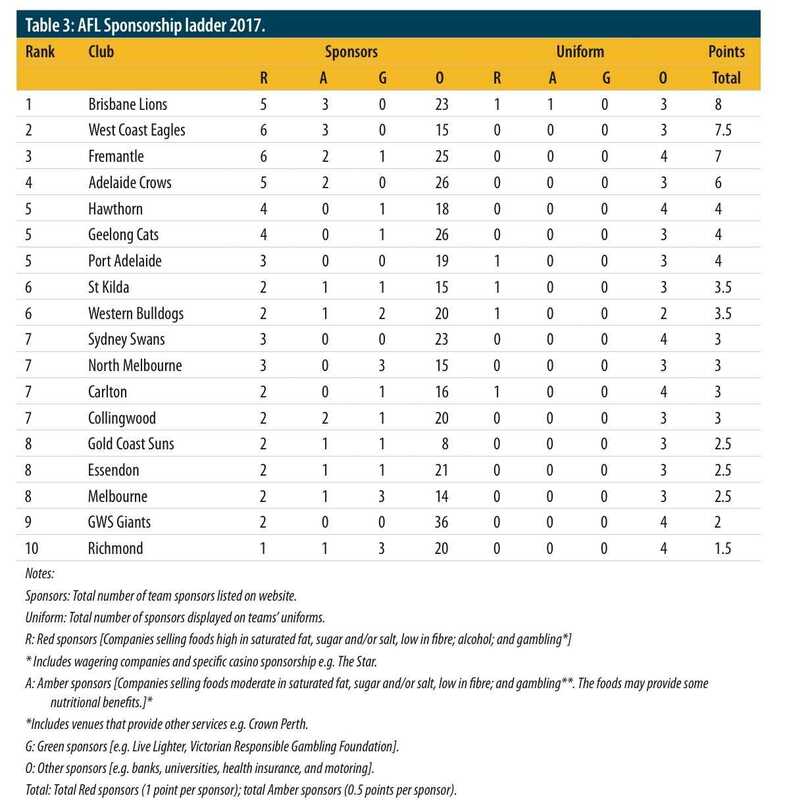 The findings were used to make an ‘AFL Sponsorship Ladder’, a ranking of AFL clubs in terms of their level of unhealthy sponsorships, with those at the top of the ladder having the highest level of unhealthy sponsors. The study clearly demonstrated that Australia’s most popular spectator sport is saturated with unhealthy advertising. Sponsorship offers companies an avenue to expose children and young people to their brand, encouraging a connection with that brand. 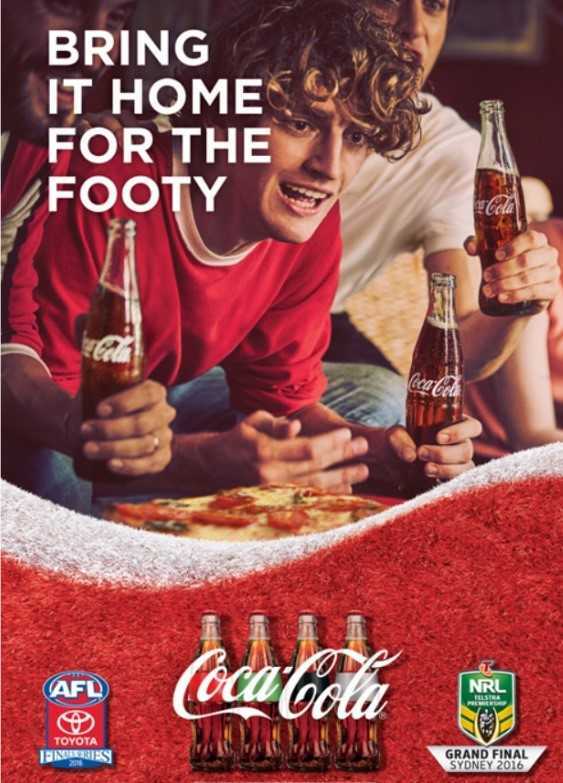 The AFL could reinforce healthy lifestyle choices by shifting the focus away from the visual presence of unhealthy sponsorship, while taking steps to ensure that clubs remain commercially viable. 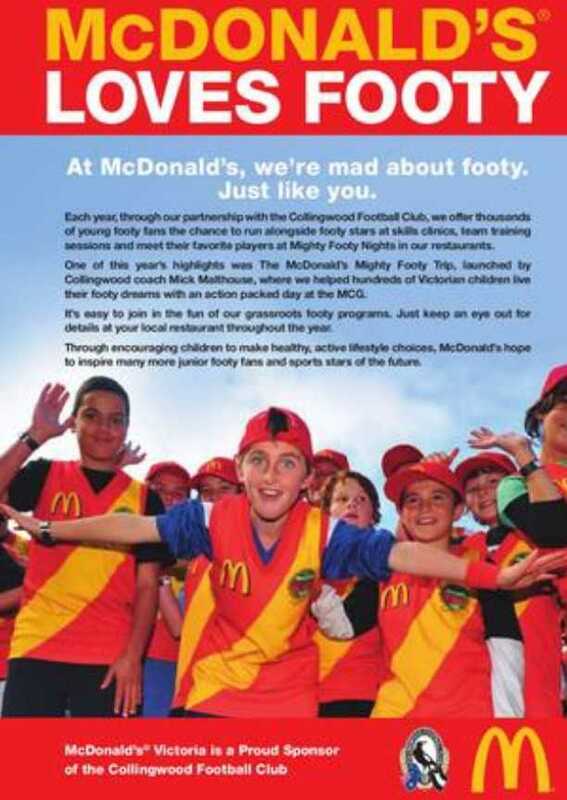 The study noted that children are often the targets of AFL advertising. This is despite World Health Organization recommendations that children’s settings should be free of unhealthy food promotions and branding (including through sport) due to the known risk it poses to their diet and chances of developing obesity. 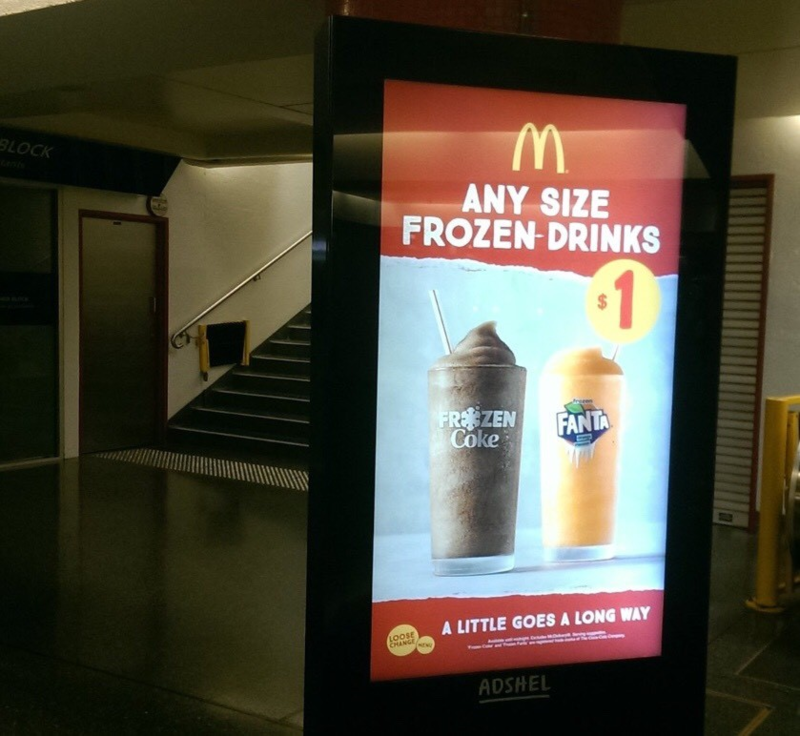 “Australian health policy makers need to consider innovative health promotion strategies and work together with sport clubs and codes to ensure that unhealthy advertising is not a feature. We successfully removed tobacco advertising from sport and we can do it with junk food and gambling too,” Mr Slevin said. The recently released Sport 2030 plan rightly identifies sport as a positive vehicle to promote good health. But elite “corporate sport” plays a role of bypassing restrictions aimed at reducing exposure of children to unhealthy product marketing. 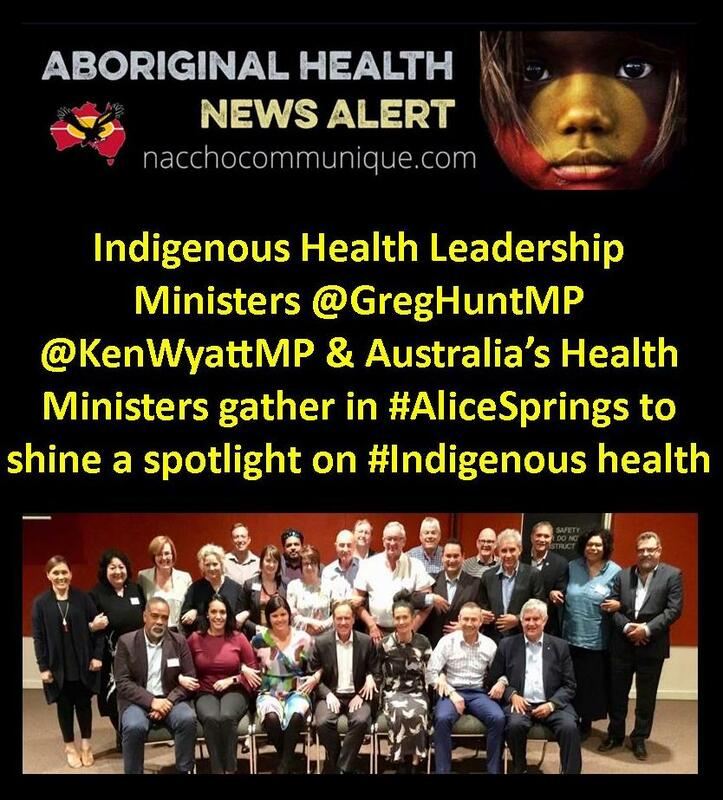 “Australia’s Health Ministers have gathered in Alice Spring to shine a spotlight on Indigenous health, almost 10 years after the Council of Australian Governments (COAG) approved Closing the Gap targets to achieve health equality for First Nations peoples. While we can reflect on progress – our people, on average, are living longer with fewer dying from chronic conditions – it is equally important to focus on our failure to close the gap in life expectancy, which remains about 10 years. For sustainable change, however, local family warriors must step up, be respected, acknowledged and encouraged. 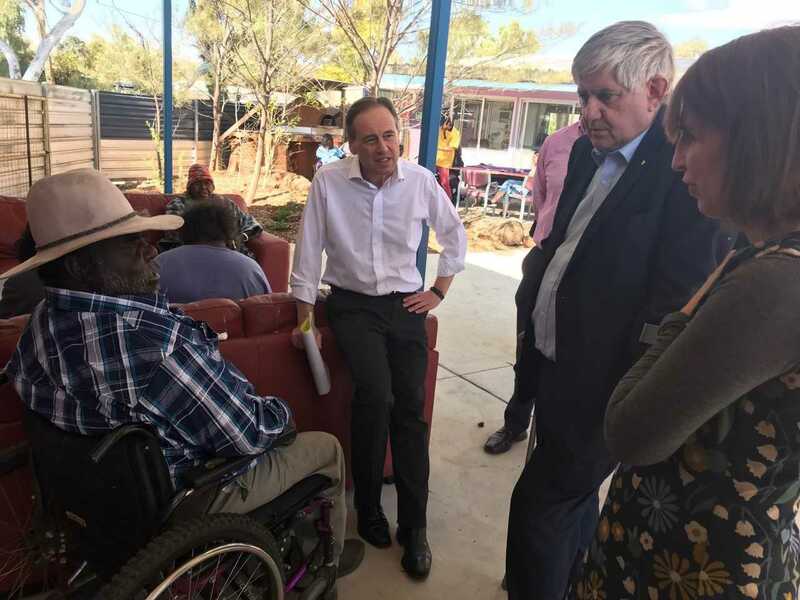 Today we visited the Purple House Renal Clinic in Alice Springs and have seen first-hand the debilitating effects of poor kidney health. Kidney disease disproportionately affects Indigenous Australians — research has shown that almost one in five (18 per cent) Aboriginal and Torres Strait Islander people aged over 18 had indicators of chronic kidney disease. I am delighted that we can announce $327,192 for Monash University to develop a point-of-care test for the diagnosis and management of chronic kidney disease. Social and emotional well-being was another critical matter for Aboriginal and Torres Strait Islander Australians, especially youth. 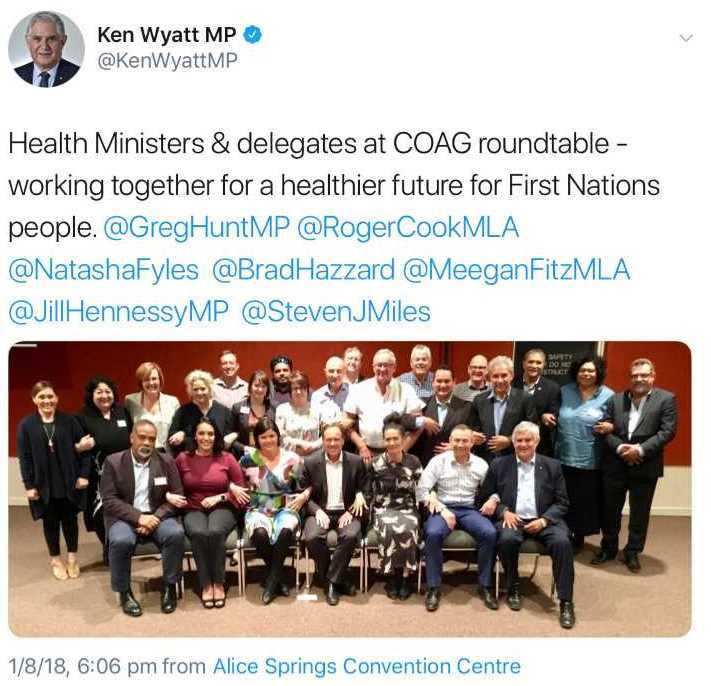 The Australian Institute of Health and Welfare has found that the single largest contributor to ill health amongst Aboriginal and Torres Strait Islander Australians is mental health and substance use disorders,” said Minister Hunt. Five projects across five different states will examine social and emotional well-being issues affecting Aboriginal and Torres Strait Islander infants, children, adolescents and young adults. For over 65,000 years, First Nations people thrived without a plethora of organisations. We were child, family and community-centred. Responsibility and authority revolved around a woman, with her key roles as the mother and protector, and equally, around a man, the father and family shield. This year, I am focusing on five areas – renal health, rheumatic heart disease (RHD), avoidable blindness, avoidable deafness and crusted scabies. First Nations people experience 7.3 times the burden of chronic kidney disease than other Australians. In the Northern Territory, RHD is 37 times more prevalent and, overall, we endure three times the rate of vision impairment. Our children suffer, on average, 32 months of hearing loss compared with three months for other Australian children, while remote northern communities have the world’s highest rates of crusted scabies. We are losing too many lives and not realising the potential of too many more. In many remote locations, doctors and health workers are joined by fly-in fly-out health practitioners, providing specialist services. However, we must ensure a local army of individuals on the ground is empowered to monitor for signs of illness. We need home-based heroes, family warriors, as they were in times past – and still are in functional families. They need to understand that infections such as skin sores can be precursors to RHD, kidney failure and crusted scabies. We are not going to fully transform the health of those who are struggling, until they understand with pride and responsibility, the culture that perpetuated healthy lives for thousands of years. Our mothers and fathers, uncles, aunts and grandparents are the first protectors of our children. Now extended to 136 communities, the Better Start to Life program is proving the power of engaging with and supporting young parents to understand their responsibilities. The Turnbull government has invested significantly in these areas but the record $3.9 billion committed to Indigenous health over the next four years will only ever be part of the currency of change. It’s now time to highlight the heroes within our families, to move from disempowerment to empowerment, away from a deficit model. I encourage every mother, father, uncle, aunt and Elder to become a warrior for health, joining in and taking responsibility for their own health and the health of their families. The Government has committed $23.2 million through the National Health and Medical Research Council (NHMRC) to 28 new projects, and has launched a NHMRC Road Map 3 to help chart the direction for Indigenous health and medical research investment over the next ten years. New research investment will include targeted renal, cancer and social and emotional wellbeing projects aimed at improving Aboriginal and Torres Strait Islander health outcomes. The five projects together form the first of a series of targeted calls for research by the NHMRC to address Indigenous health priorities. Other calls will include healthy ageing and nutrition. Minister for Indigenous Health, Ken Wyatt AM, said the new research projects would help to strengthen work already underway to curb chronic disease. “The renal point-of-care test will complement the Renal Health Road Map that is currently being compiled,” Minister Wyatt said. Other key research projects announced today include point-of-care testing for blood-borne diseases and sexually transmitted infections, reducing incarceration rates of young women, improving prisoner mental health, burns care, lung health, scabies testing and reducing unborn baby deaths. The direction of future First Nations research will be informed by the NHMRC’s Road Map 3, which will include a yearly report card and a commitment to spend at least 5% of annual NHMRC funding on Aboriginal and Torres Strait Islander health and medical research. “Most importantly, the NHMRC Road Map 3 was developed in consultation with communities, First Nations researchers and the broader health and medical research sector to address Indigenous health issues and encourage and strengthen the capacity of Indigenous researchers, now and into the future,” said Minister Wyatt. The NHMRC has today also released the Ethical conduct in research with Aboriginal and Torres Strait Islander Peoples and communities: Guidelines for researchers and stakeholders as well as Keeping Research on Track II. The Guidelines provide a set of principles to ensure that research is safe, respectful, responsible, high-quality and of benefit to Aboriginal and Torres Strait Islander people and communities. ” I am very pleased that one of my first announcements as AMA President was the AMA endorsement of the Uluru Statement from the Heart. The Uluru Statement expresses the aspirations of Aboriginal and Torres Strait Islander people with regard to self-determination and status in their own country. The AMA has for many years supported Indigenous recognition in the Australian Constitution. The Uluru Statement is another significant step in making that recognition a reality. The AMA is committed to improving the health and wellbeing of Aboriginal and Torres Strait Islander peoples. 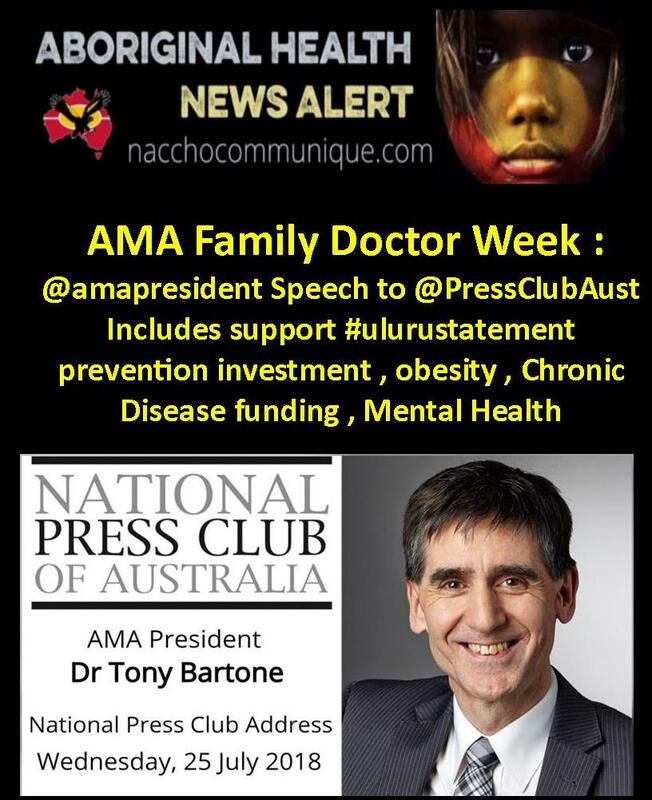 ” This week just happens to be AMA Family Doctor Week – a tribute to hardworking GPs. GPs of Australia, I salute you. We all salute you. Your hard work and dedication is highly valued. The AMA will always support you and promote you. Your GP – your family doctor – will ensure that your health needs are met throughout all stages of your life. Be it immunisation, preventative health care, age specific medical checks, chronic disease management, or aged care, the life long relationship with your GP underpins continuous and appropriate care. 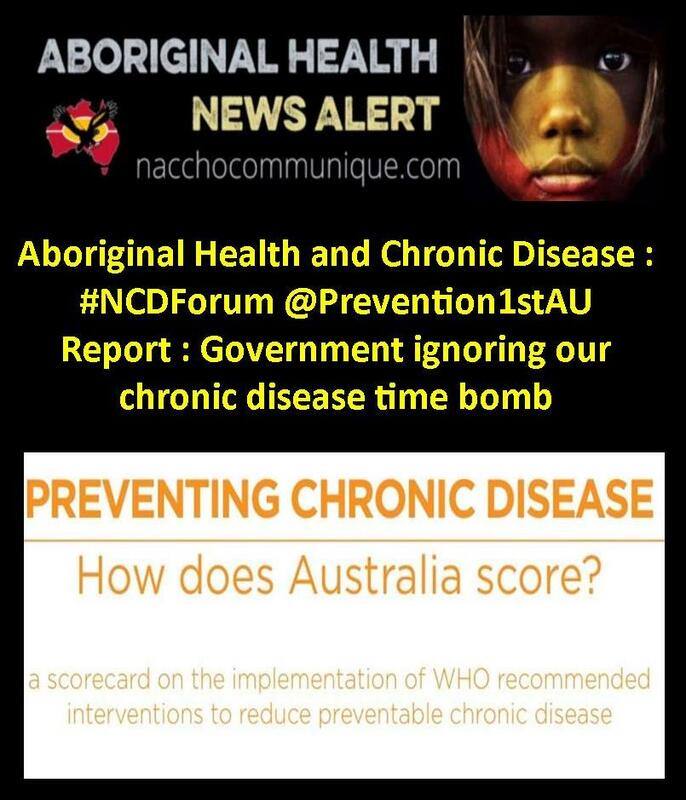 ” The burden of chronic disease in Australia is significant. Chronic disease is responsible for around 83 per cent of premature deaths and 66 per cent of the burden of disease. Chronic disease has a significant impact on the health system, but the reality is that most of these conditions can be prevented. It simply makes enormous sense to invest in prevention. Taxes collected from tobacco and alcohol excise generate around $16 billion each year for the Government. 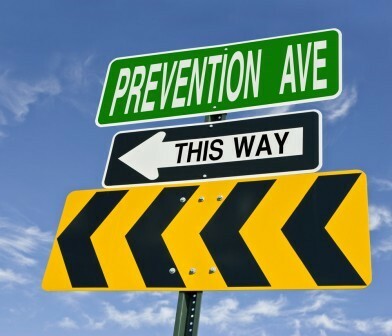 In return, total Government spending on prevention is around $2 billion a year, which equates to about $89 per person. If we are to reduce the impact of chronic disease in Australia, all our governments must invest more in prevention. Tackling obesity is a priority. It is a humbling experience to be elected President of such a proud and respected organisation as the AMA. It is an equally humbling experience to speak here at the National Press Club in Canberra. I thank the Press Club for this opportunity. I am a GP, and I have been in practice in the northern suburbs of Melbourne for more than 30 years. Some of you may know that I was inspired to become a GP by watching my own family doctor, who cared for my ill father when I was growing up. Even now, my mother reflects on the care and dedication my family GP displayed in caring for her family. It’s no surprise that he became an early mentor in my professional life. I have seen it all as I have looked after the health of my community and my patients, including generations of the same families. I like to think that my experience has given me some credibility in knowing what works and what doesn’t work in the health system, especially in primary care. My overarching concern has always been the patient journey – ensuring that people get the right care at the right time in the right place by the right practitioner. The priorities for me are always universal access to care, and affordability. Today, I will share my views on what can be done to make our great health system even better – how to improve the patient journey. I will also introduce you to some of my patients, and reflect on the barriers in their access to timely care, to further illustrate our concerns. On the day I was elected, I made it very clear that one of the hallmarks of my Presidency would be stridently advocating for significant investment in general practice. 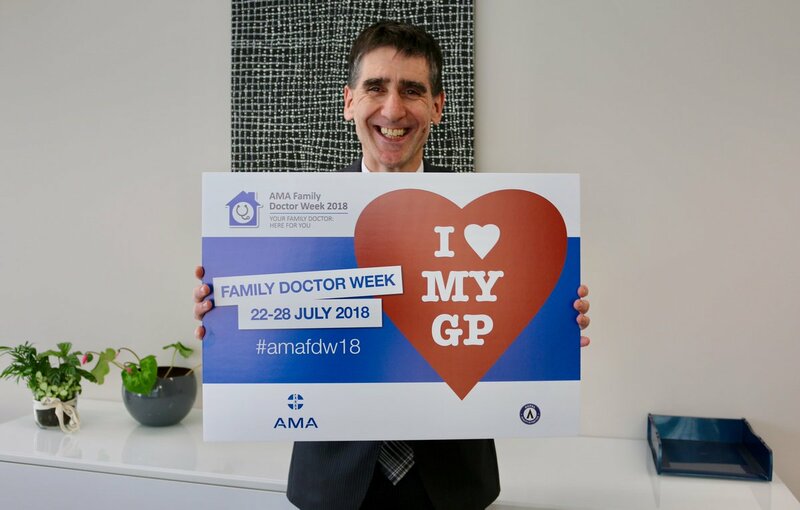 This week just happens to be AMA Family Doctor Week – a tribute to hardworking GPs. However, there is something really crook about how GPs have been treated by successive Governments. They have paid lip service to the critical role GPs play in our health system, often borne out of ignorance and often in a misguided attempt to control costs. General practice has been the target of continual funding cuts over many years. These cuts have systematically eaten away at the capacity of general practice to deliver the highest quality care for our patients. They threaten the viability of many practices. I talk to my GP members regularly, both metropolitan and rural. The message is simple – some are at a tipping point and have a very bleak view of the future. They see general practice becoming increasingly corporatised, burdened with more red tape, and GPs are less able to spend the necessary time with patients. This is not the future that GPs want to see. This is not the future that our patients want to see. We can and must avoid these bleak predictions, but it requires significant real and immediate investment from the Government with a clear pathway to long-term reform. Let me be very clear about this: we must put general practice front and centre in future health policy development. We have seen too many mistakes. Too many poor policy decisions. Despite the Government’s best intentions – and lots of goodwill within the profession – the Health Care Homes trial and implementation failed to win the support of GPs or patients. Instead of real investment, the Trial largely shifted existing buckets of money around. It has fallen well short of its practice enrolment targets, and it looks like only a small fraction of the targeted 65,000 patients will sign up. There is no doubt that the challenge of transforming general practice was severely underestimated by policy makers. At least with this model. But general practice still needs transformation and rejuvenation to meet growing patient demand and to keep GPs working in general practice. The AMA has a plan for reform of general practice and primary care. It is patient-centred and focuses on better access to long-term continuous quality care and managing patients more effectively in the community. It takes the best elements of the ‘medical home’ concept and adapts them to the Australian context. It is a plan that will require upfront and meaningful new investment, in anticipation of long-term savings in downstream health costs. In the longer term, we need to look at moving to a more blended model of funding for general practice. While retaining our proven fee-for-service model at its core, the new funding model must have an increased emphasis on other funding streams, which are designed to support a high performing primary care system. This will allow for increasing the capability and improving the infrastructure supporting general practice to allow it to become the real engine room of our health system. It is about scaling up our GP-led patient-centred multidisciplinary practice teams to better provide the envelope of health care around the patient in their journey through the health system. A good example is the Blacktown Hospital Diabetes Outpatient Clinic in New South Wales. This Clinic has a waiting time of less than a week because the service is distributed to its catchment GPs with the appropriate funding and support for both personnel and infrastructure. This is a small example, but a significant one when you consider the scale and prevalence of diabetes across Australia, let alone the western suburbs of Sydney, and the average access times for outpatient hospital clinics. We cannot continue to do things the way we always have. The bulk-billing rate should not be the metric by which we judge the performance of general practice. One in two people now report having at least one of these eight common chronic conditions. These conditions account for around 60 per cent of the total disease burden, and they contribute to nearly 90 per cent of deaths in Australia. We must reshape our primary care system to meet these challenges. We must put in place the funding support that general practice needs to better manage patients in the community – and keep people out of hospital. Our plan is a smarter and more sustainable blueprint … a better plan for general practice. A better plan for Australians. We also need a better plan for public hospitals. In an election year, voters tend to focus very closely on public hospitals when they are comparing health policies. Public hospitals are a critical part of our health system. They are highly visible. They are greatly loved institutions in the community. They are vote changers. The doctors, nurses, and other staff who work in our public hospitals are some of the most skilled in the world. In 2016-17, public hospitals provided more than six and a half million episodes of admitted patient care. They managed 92 per cent of emergency admissions. If the state of general practice is crook, then our public hospitals are on permanent code yellow. Despite their importance, and despite our reliance on our hospitals to save lives and improve quality of life, they have been chronically underfunded for too long. Between 2010-11 and 2015-16, average annual real growth in Federal Government recurrent funding for public hospitals has been virtually stagnant – a mere 2.8 per cent. The AMA welcomes that, between 2014-15 and 2015-16, the Federal Government boosted its recurrent public hospital expenditure by 8.4 per cent. But a one-off modest boost from a very low base is not enough. I deal with the results of stressed public hospitals every day and manage the impact it has on my patients. Ollie is a patient with well-controlled Parkinson’s disease. He now also has a recently diagnosed lung cancer, which has been caught early, resected, and appropriately managed. But he has been denied care for his resulting poor control of his Parkinson’s disease in the same hospital’s neurology outpatient department and referred back to me. I have been advised that I must source an alternative option for his neurological care. Another of my patients, Carlo, is a victim of the never ending Federal-State buck passing when it comes to health. 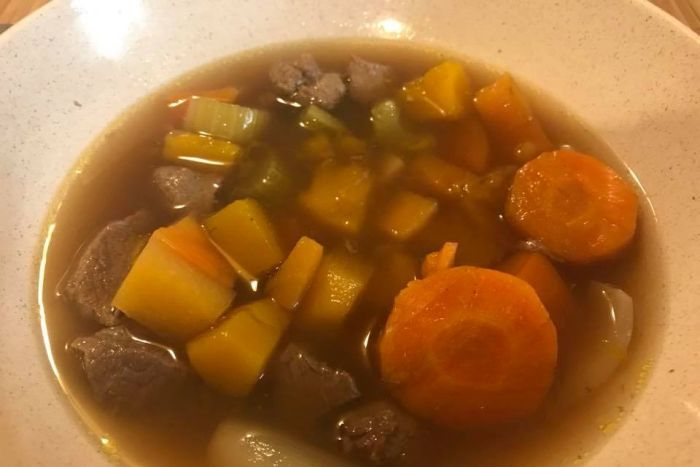 Having developed poorly controlled reflux and having been referred to the local hospital outpatient department for a gastro consult, Carlo was referred back to me. I was advised that I had to arrange a referral at the same hospital’s diagnostic imaging service for a possible coordination and swallowing problem, which ultimately proved correct. He was then referred back to the gastroenterology department to manage his newly diagnosed oesophageal condition. Barbara is another very common example of the funding chaos. She is a very active 68-year-old lady who was troubled by severe osteoarthritis of the knee for many years. She was placed on a waiting list for surgery two years ago. She has had to attend our practice regularly for pain management and supportive referrals for physiotherapy, while I continued to manage the consequences of her inability to lose weight due to her exercise restrictions and worsening diabetes and blood pressure profile. She has just finally had her knee joint replaced. These are the experiences of everyday patients. They underpin the troubling headlines that came from the AMA’s 2018 Public Hospital Report Card. Our hospitals are stretched to the limit. Likewise, the AMA’s Safe Hours Audit is a window into the lived experience of dedicated doctors, struggling to deliver quality care in over-crowded, under-funded hospitals. But instead of helping the hospitals improve safety and quality, governments decided to financially punish hospitals for poor safety events. There is no evidence to show that financial penalties work. Health care is complex. Not all patient complications can be avoided. The 2020-25 hospital funding agreement does little to improve the situation. Funding levels stay the same, but public hospitals will have to do more with it to help coordinate patient care post-discharge. The AMA supports better discharge planning and integrated care, especially for patients with complex and chronic disease. But this will cost money – and public hospitals need extra funding. The AMA calls on the major parties to boost funding for public hospitals beyond that outlined in the next agreement. There must be a plan to lift public hospitals out of their current funding crisis, which is putting doctors and patients at risk. Governments must stop penalising hospitals for adverse patient safety events. We need policies to fully fund hospitals. We must help them improve patient safety and build their internal capacity to deliver high value care in the medium to long term. They must link up and work with primary care to deliver better coordinated care. I note that Labor has pledged an extra $2.8 billion for public hospitals. I expect that the Coalition will match that as the election draws nearer. They do not want another Medi-scare style campaign. Older Australians are voters, too. Aged care was, until very recently, one of the highest profile segments of the health system – but for all the wrong reasons. It is now emerging as an area in need of significant reform as the population ages and lives longer. Older Australians all too frequently do not have the same access to medical care as other age groups – a longstanding result of inadequate funding in the aged care system. This inequity will likely only grow as the Australian population ages with more complex, chronic medical conditions requiring more medical attention than ever before. We have witnessed numerous consultations and reviews. Enough! Now is the time for action. There is already sufficient information to underpin the final recommendations. It is simply unfair and unjust to delay this any further. An increase in funding for GP visits to aged care facilities would result in many savings, including from reduced ambulance transfers to hospital emergency departments. Changes to after-hours care remuneration must consider services that are currently provided under ‘urgent’ item numbers to patients in aged care facilities. We also need to ensure that the critical role that nurses play in caring for older Australians is recognised in those facilities. The AMA wants to see Medicare rebates that adequately cover the time that doctors spend with the patient assessing and diagnosing their condition and providing medical care. We want new telehealth Medicare items that compensate GPs, and other medical specialists, for the time spent organising and coordinating services for the patient. This includes the time that they spend with the patient’s family and carers to plan and manage the patient’s care and treatment. There must be funding for the recruitment and retention of quality, appropriately trained aged care staff. And we must reverse the decline in the proportion of Registered Nurses in aged care. The AMA Aged Care Survey, released today, shows that AMA members who work in aged care have identified the shortage of Registered Nurses – who should be available 24 hours a day – as the biggest priority for aged care reform. The survey also shows that one in three doctors are planning to cut back on, or completely end, their visits to patients in aged care facilities over the next two years. This is largely because the Medicare rebates are inadequate for the amount of time and work involved. The AMA will ensure that aged care gets the attention and profile it deserves in the election campaign. Private health insurance has been in the headlines for much of the past year – again, for all the wrong reasons. The AMA has always called for a simpler and fairer private health insurance system. Without the private system, the public system would likely collapse. But we cannot expect the private system to thrive – or even survive – if there is not value in insurance policies. Patients are smart – they know there is no point outlaying thousands of dollars every year if the coverage isn’t there. Affordability means very little without value. We are clearly at a crisis point in private health insurance. And the Government knows it. Hence the latest Review, and the recent announcement by the Minister of new categories of policies … and greater transparency. We support the concept of developing Gold, Silver, and Bronze insurance categories. We can’t expect consumers to understand the many different definitions, the carve outs, and exclusions of some 70,000 policy variations. Australians want reasonable and simple things from their insurance. They want a choice of the practitioner, and a choice of the hospital. They want treatment when they need it. We can’t have patients finding out they aren’t covered after the event, or when they require treatment and it’s all too late. To that end, we have been very clear – we don’t support the use of restrictions in Gold, Silver, and Bronze. Restrictions lead people to believe they are covered, when in reality they are exposed to additional costs. We don’t support junk policies. If a Basic policy category doesn’t provide much coverage, that should be made crystal clear. We don’t support dismantling community rating. This must be protected to maintain equity of access to private health treatment. When the objective is to support a strong private health sector to take pressure off the public sector, it makes no sense to financially discourage the patients who are most likely to need access to private health. We support standard clinical definitions. Whatever is involved for coverage for heart conditions should not vary between insurers and policies. I urge the Government to continue to work with the Colleges to ensure that these definitions are robust. There is increasing corporatisation of private health and the market power is shifting in favour of private health insurers. Insurers, whether private or via Medicare, cannot determine the provision of treatment in Australia. They cannot and must not interfere with the clinical judgement of medical practitioners. Australians do not support a US-style managed care health system. Neither does the AMA. One area we are disappointed with in the recent announcements is pregnancy cover. It does not make sense to us, as clinicians, to have pregnancy cover in a higher level of insurance only. Many pregnancies are unplanned – meaning people are caught out underinsured when pregnancy is restricted to high-end policies. Pregnancy is a major reason that the younger population considers taking up private health insurance. They are less likely to be able to afford the higher-level policies. We need to make sure it is within reach. I having female reproductive services at a different level to pregnancy coverage is, to us, problematic, and will leave a lot of people caught out. There will be much more to talk about as the private health reforms are finalised and bedded down. As a suburban GP who sees the whole range of health ailments and conditions, an area of special interest to me is mental health. I do not think the unique role and special skills of GPs are used enough at the front line of mental health care. The AMA earlier this year called for a national, overarching mental health “architecture”, and proper investment in both prevention and treatment of mental illnesses. Almost one in two Australian adults – that is more than seven million people – will experience a mental health condition in their lifetime. Almost every Australian will experience the effects of mental illness in a family member, friend, or work colleague. More than half a million children and adolescents, aged four to 17, experienced mental health disorders in 2012-13. And yet mental health and psychiatric care are grossly underfunded. Strategic leadership is needed to integrate all components of mental health prevention and care. For mental health consumers and their families, navigating the system and finding the right care at the right time can be difficult and frustrating. There is no vision of what the mental health system will look like in the future. Poor access to acute beds for major illness leads to extended delays in emergency departments. Poor access to community care leads to delayed or failed discharges from hospitals. And poor funding of community services makes it harder to access and coordinate prevention, support services, and early intervention. Significant investment is urgently needed to reduce the deficits in care, fragmentation, poor coordination, and access to effective care. We have repeatedly called for support for carers of people with mental illness, which is often the result of necessity, not choice. Access to respite care is vital for many people with mental illness and their families, who are the ones who bear the largest burden of care. I am very pleased that one of my first announcements as AMA President was the AMA endorsement of the Uluru Statement from the Heart. It is simply unacceptable that Australia, one of the wealthiest nations in the world, cannot solve a health crisis affecting fewer than three per cent of its citizens. There is not enough time today to cover all the issues I would like to cover in one speech. I could deliver a whole speech on each of the following topics – medical workforce, rural health, medical research, genetic testing, e-cigarettes and vaping, opioids, medicinal cannabis, scope of practice, asylum seeker health, the NDIS, or palliative care, to name just a few. I could probably manage a few words about the My Health Record, too. No doubt there will be questions about that. But I have to talk to you about prevention, if only briefly. The burden of chronic disease in Australia is significant. This amounts to a measly 1.34 per cent of all health spending. This is considerably less than comparable countries such as Canada, the United Kingdom, and New Zealand. Doctors are well placed to identify and support patients who are overweight or obese. Two thirds of adults are either overweight or obese. The evidence shows that advice to lose weight given by a doctor increases the motivation to lose weight. It also increases engagement in weight loss behaviours. But the support and advice from doctors can only achieve so much. Population level measures are needed. We need to see action on a sugar tax, banning junk food advertising to kids, and improving urban planning to help get people moving and active. Governments have the tools to implement these measures. 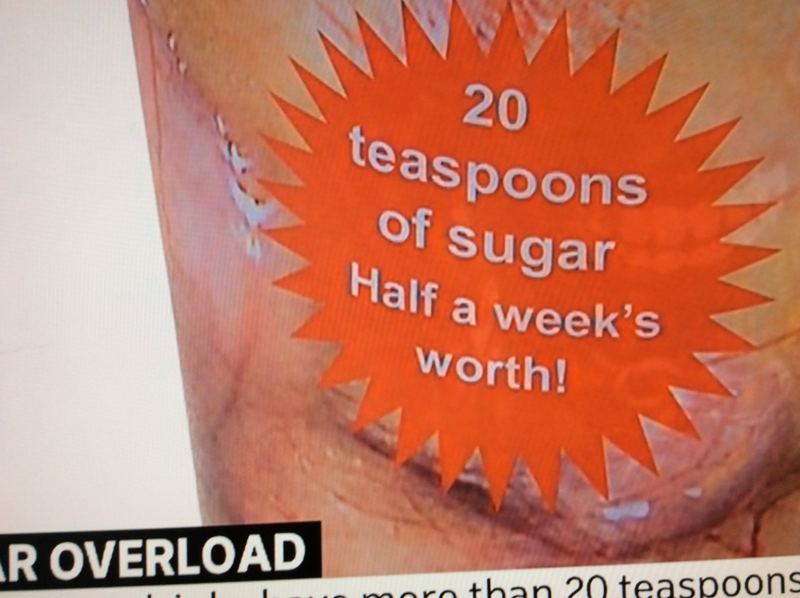 A sugar tax would be a good start. In closing, I know the challenges ahead for the health system. I will dedicate my Presidency to improving health policy so that we have a system that delivers the best possible care to our patients. The AMA will be a very strong and loud advocate. There is nothing like a Federal election to help our political leaders share the public’s interest in good health policy. The election will happen within twelve months, possibly this year. Along with the members of the National Press Club, the AMA will be watching the political events of this weekend and the coming months with very close interest. 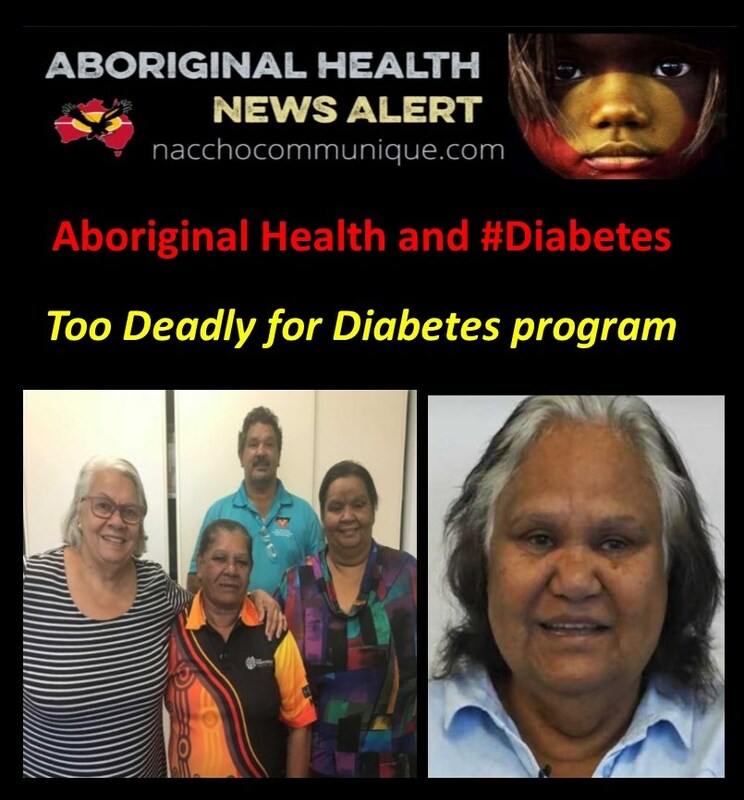 ” Too many Australians especially Aboriginal and Torres Strait Islanders are being diagnosed with diabetes too late. This is true for both type 1 diabetes and type 2 diabetes. The delay in diagnosis is putting many people at risk of major life-threatening health problems. Early diagnosis, treatment, ongoing support and management can reduce the risk of diabetes-related complications. 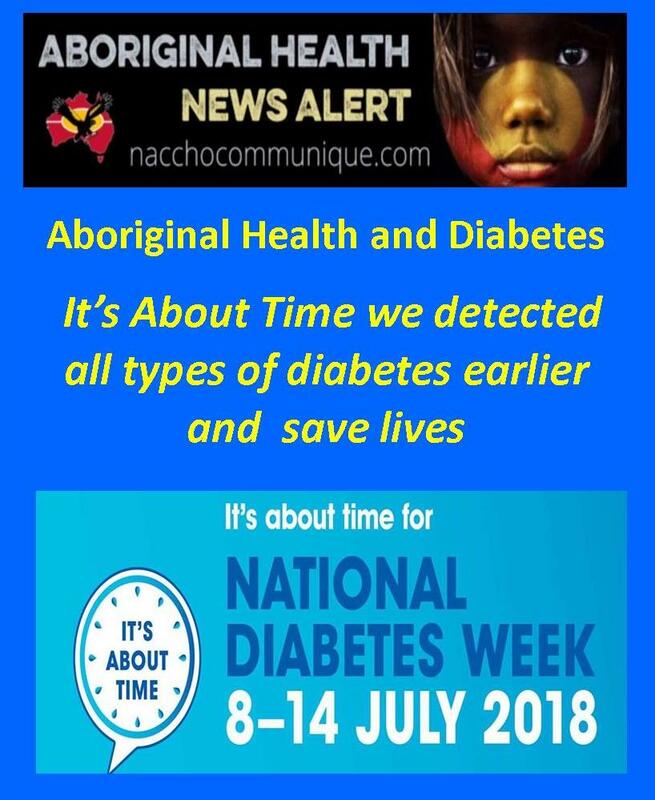 ” Aboriginal and Torres Strait Islander people are almost four times more likely than non-Indigenous Australians to have diabetes or pre-diabetes. Improving the lives of people affected by all types of diabetes and those at risk among Aboriginal and Torres Strait Islander communities is a priority for Diabetes Australia. You can reduce the risk of developing type 2 diabetes by eating a more healthy diet and being physically active which will help maintain a healthy weight to keep your sugar (glucose) levels normal and your body strong. 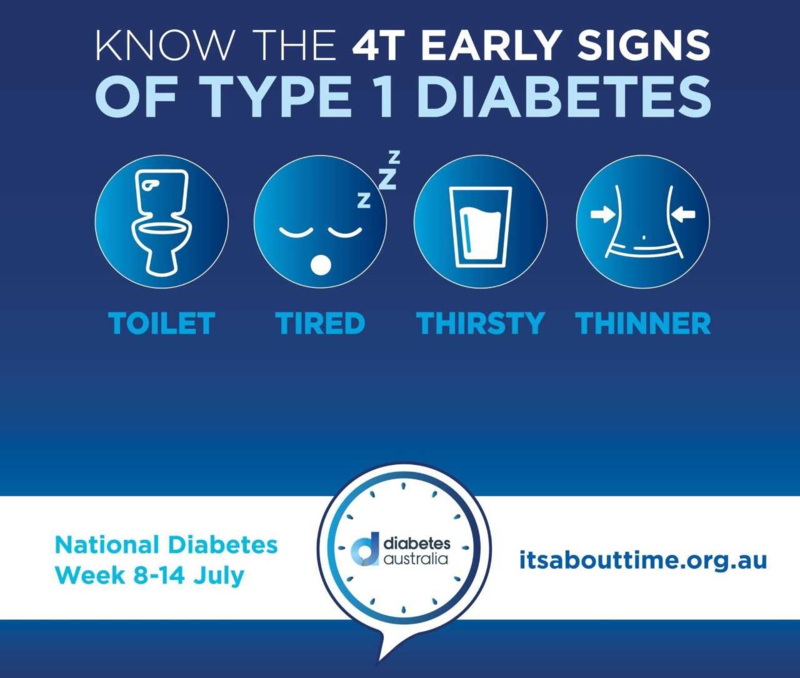 ” This National Diabetes Week, the Rural Doctors Association of Australia (RDAA) is urging rural and remote Australians to be alert for the early signs of diabetes, and to see their doctor as soon as possible if they are showing any symptoms. ” Digital technology is changing the way people living in regional and remote communities access information, and now there’s a new app to help people with diabetes. 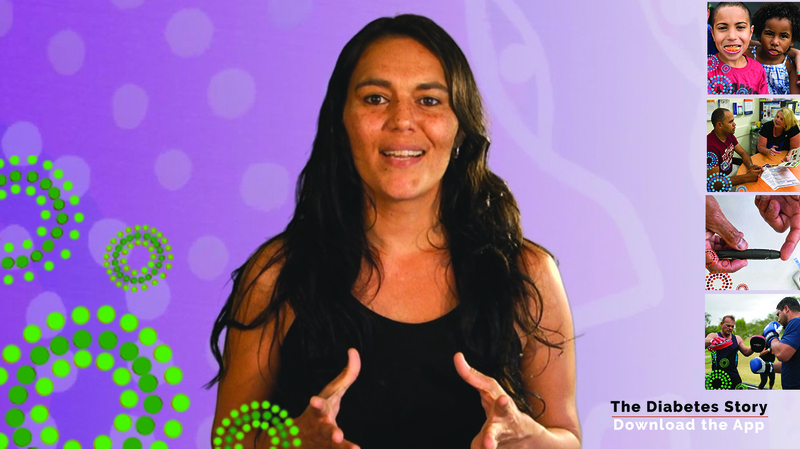 Taken directly from a program used in 70 touchscreen kiosks throughout Australia, the Diabetes Story is a health information module developed specifically for Aboriginal and Torres Strait Islander people. “The theme of National Diabetes Week this year, It’s About Time, reflects the fact that too many Australians are being diagnosed with diabetes too late” RDAA President, Dr Adam Coltzau, said. “In the case of Type 1 diabetes, late diagnosis can be life-threatening. “And with any type of diabetes, early diagnosis, treatment and ongoing management can reduce the risk of diabetes-related complications. “Symptoms for both these types can include excessive thirst, passing more urine, feeling tired and lethargic, and always feeling hungry — though many people with Type 2 diabetes often display no symptoms at diagnosis. “Gestational diabetes is another form of diabetes, which typically affects between 12% and 14% of pregnant women and usually occurs around the 24th to 28th week of pregnancy. “People who develop Type 1 diabetes will typically need to go onto insulin therapy for life (or until a cure is found), delivered either by multiple daily injections or via an insulin pump attached to their body. “While Type 1 diabetes cannot be prevented, Type 2 diabetes can be delayed or prevented in up to 58 per cent of cases. “Preventative health care starts with visiting your doctor for check ups and identification of early signs of Type 2 diabetes or pre-diabetes. “Maintaining a healthy weight, being physically active and following a healthy eating plan, as well as managing blood pressure, cholesterol levels and not smoking, all help to prevent Type 2 diabetes from developing. “Should Type 2 diabetes develop, early detection and management through lifestyle modifications is key to minimising its impact, as well as ensuring the early detection and treatment of any complications. Digital technology is changing the way people living in regional and remote communities access information, and now there’s a new app to help people with diabetes. It uses digital technology to explain a complex issue in a direct, interesting way that encourages people “to take charge of their diabetes”. It is an interactive self-management module that delivers culturally appropriate health and wellbeing diabetes information. Consumers can use it on their mobile phones while health workers and educators will be able to use it on tablets to conduct mediated diabetes education sessions, and to provide further support for self-management. The App also has an audio function. 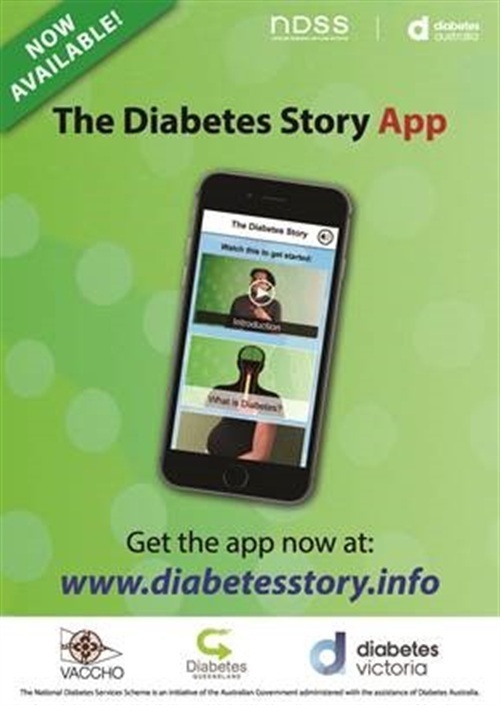 The Diabetes Story, both the module and App, has been a collaborative partnership with Aboriginal and Torres Strait Islander health organisations such as the Victorian Aboriginal community Controlled Health Organisation (VACCHO), the Victorian Aboriginal Health Service (VAHS), Aboriginal Community Controlled Health Services in North Queensland, as well as Diabetes Victoria, Diabetes Qld and Diabetes Australia. The Diabetes Story project is funded under the National Diabetes Services Scheme (NDSS), an initiative of the Australian Government administered with the help of Diabetes Australia. 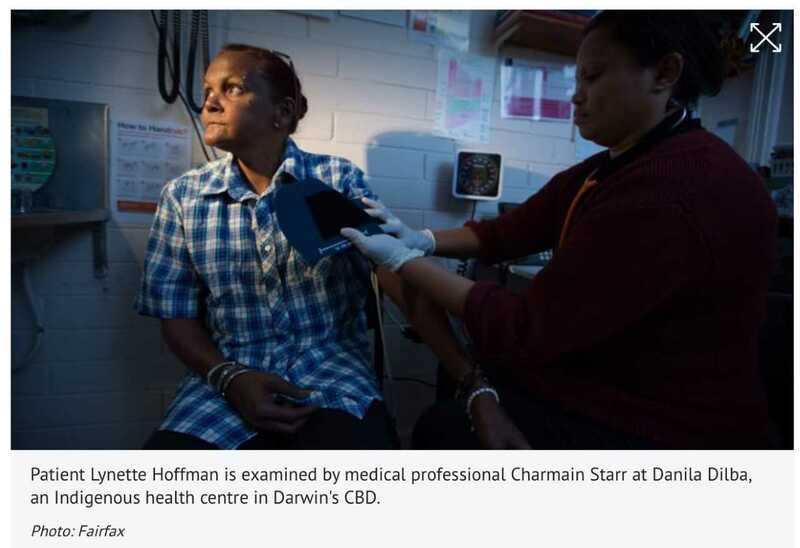 ” One in every two Australians suffer from chronic disease but experts say Commonwealth and State Governments appear blind to the country’s greatest health challenge. 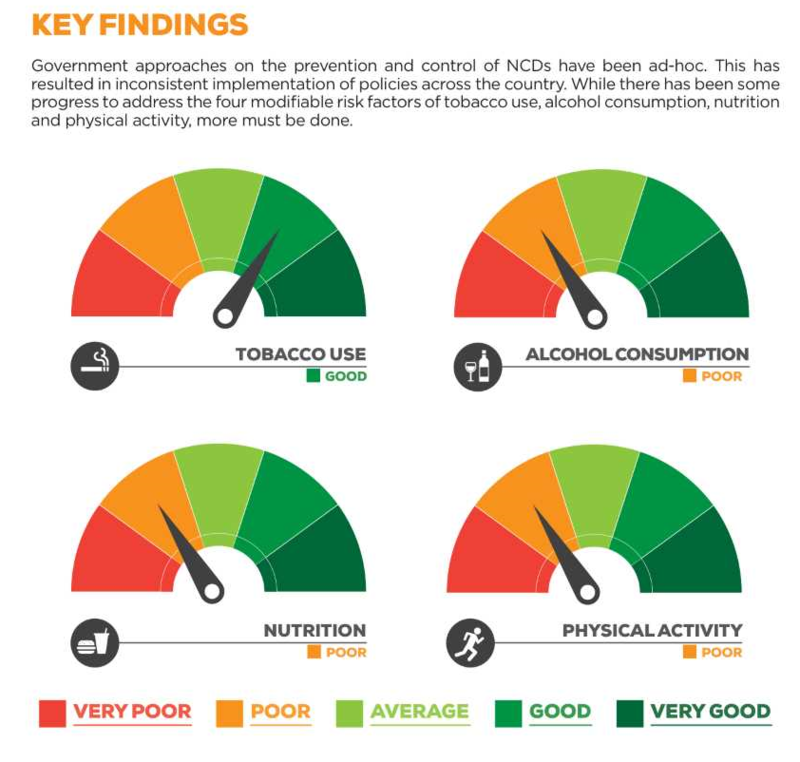 A scorecard released today by Prevention 1st found that while government anti-smoking policies are ‘good’, efforts to address alcohol consumption, physical activity and nutrition all rate poorly. 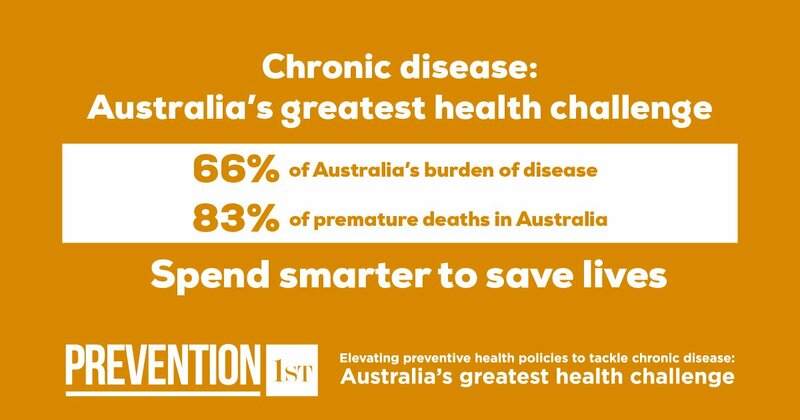 Chronic disease, which is responsible for 83 per cent of all premature deaths in Australia, accounts for 66 per cent of the burden of disease, and costs our economy an estimated $27 billion annually. According to the Australian Institute of Health and Welfare, one-third of chronic disease cases are preventable and can be traced to four modifiable risk factors: tobacco use, alcohol consumption, poor diet, and physical inactivity. FARE Chief Executive Michael Thorn says that while Australia has been a world leader in preventive health, past glories count for little, when the Prevention 1st Scorecard released today makes clear that our governments are not presently doing enough. Mr Thorn says a framework already exists around evidence-based, short-term wins and that those World Health Organization recommendations, if implemented, would immediately improve Australians’ health. The Prevention 1st Scorecard recommends the implementation of four simple evidence-based measures to address tobacco use, alcohol consumption, nutrition and physical activity. • The renewal of mass media anti-smoking campaigns that are population-wide and engage effectively with disadvantaged groups. • The abolition of the Wine Equalisation Tax (WET) and introduction of a volumetric tax for wine and cider. • Legislated time-based restrictions on exposure of children (under 16 years of age) to unhealthy food and drink marketing on free-to-air television until 9.30pm. • The implementation of a whole-of-school program that includes mandatory daily physical activity. Prevention 1st is a campaign led by the Foundation for Alcohol Research and Education (FARE), the Public Health Association of Australia (PHAA), Consumers Health Forum of Australia (CHF Australia), and Dementia Australia. 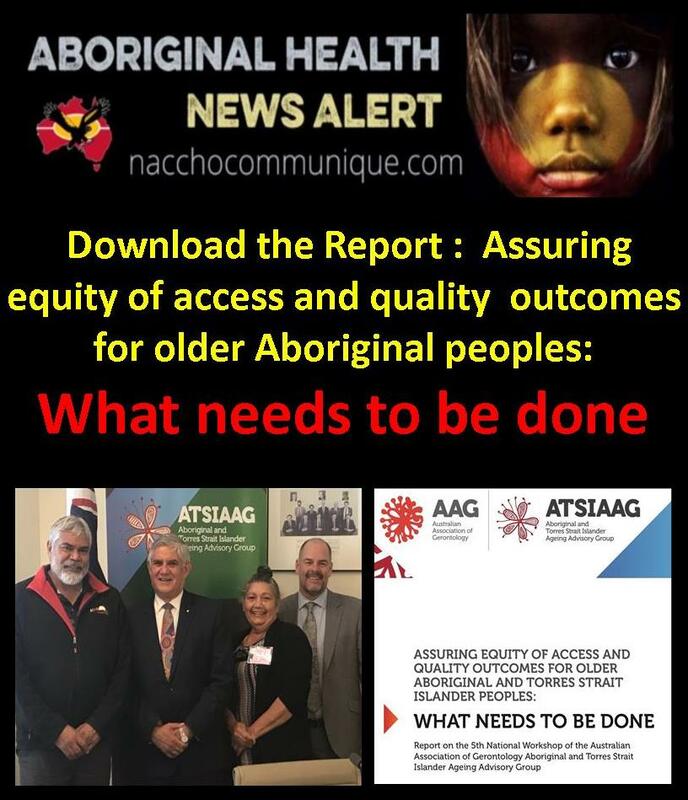 “This report details valuable recommendations to improve aged care access for our First Peoples and I commend the Australian Association of Gerontology and its special Aboriginal and Torres Strait Islander Ageing Advisory Group. In the 2016 Census, 649,171 people identified as Aboriginal and/or Torres Strait Islander, representing 2.8% of the population – up from 2.5% in the 2011 Census, and 2.3% in 2006. Although the Aboriginal and Torres Strait Islander population has a much younger age profile and structure than the non-Indigenous population, the median age of Aboriginal and Torres Strait Islander people is gradually rising. The proportion of Aboriginal and Torres Strait Islander people aged 65 years and over is only 4.8%, much smaller than for non-Indigenous people at 16%. However, the number of Aboriginal and Torres Strait Islander people aged 55 years and over is increasing, and is projected to more than double from 59,400 in 2011 to up to 130,800 in 2026. 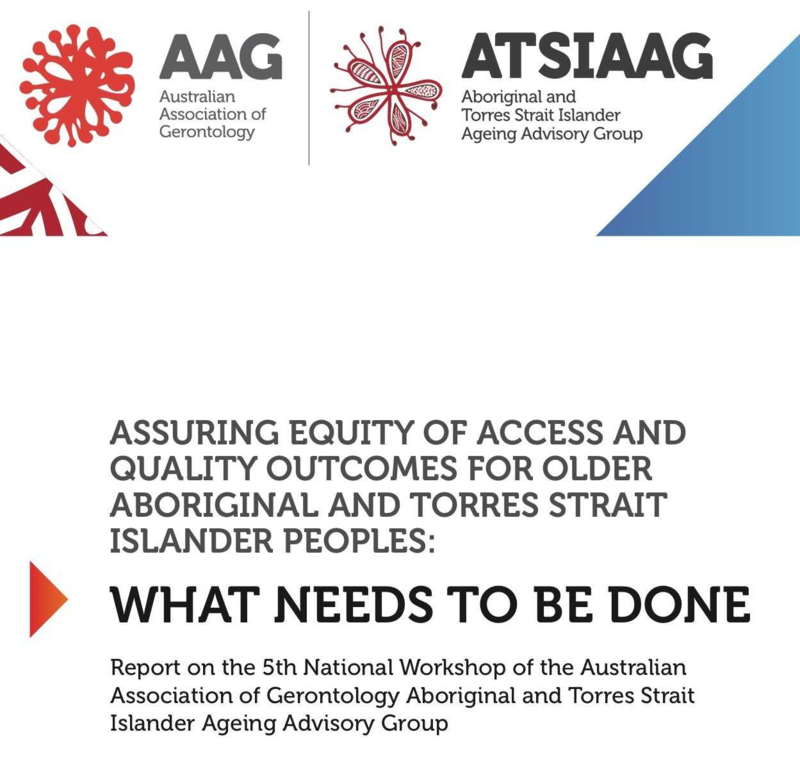 Aboriginal and Torres Strait Islander Elders need access to culturally appropriate services, and they generally want to be cared for in their communities where they are close to family, and where they can die on their land. Aboriginal and Torres Strait Islander people face ongoing challenges finding services that are appropriate to their needs and circumstances, and often have problems accessing services where they exist. My program, tailored to suit the lifestyle and culture of the Bourke participants, was not claiming to cure the disease but manage the impacts. Now thanks to a program called Too Deadly for Diabetes, Barbara Flick, the CEO of the Bourke Aboriginal Health Service , Margaret Grimes and a group of 26 other Bourke residents are tackling the disease head on. Ms Flick asked him to come to Bourke after seeing him speak at a National Aboriginal Community Health Organisation conference.d their lives had changed dramatically. Ms Flick has been planning on running another program for the local community in June. 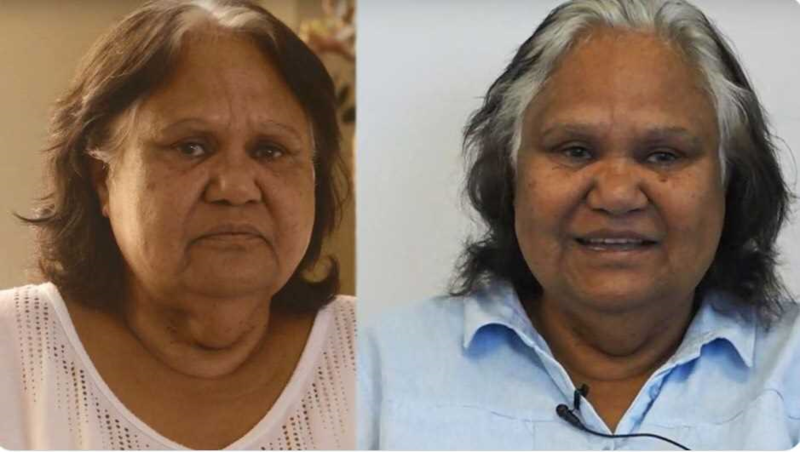 She said she had worked in health for 47 years, including a role as a national indigenous health advisor, and said she was blown away by what she had witnessed in Bourke. Margaret Grimes says she was simply waiting to die after years of living with type 2 diabetes. “I’m over giving myself needles every day, every night at the moment it’s just like I’m living for the needles,” said the 59-year-old woman from Bourke in Western NSW. She was diagnosed more than 20 years ago and is not alone in her despair over life with the disease. Barbara Flick, the chief executive officer of the Bourke Aboriginal Health Service, was diagnosed in 1986. “It’s been daily torture for me, and the information I used to get which is still being given out today I never saw any improvement in my condition,” said Ms Flick. “I believed that my life journey was to move on to renal failure and die. I believed that was my path,” she said. Ms Flick’s mother died 10 years ago from complications from diabetes. She recalled her mother challenged her on her death bed not to succumb to the disease. “I’ve lost fifteen kilos and my blood sugar levels are normal. I’ve gone from having five insulin injections a day to one small one in the morning and one small one at night,” said Ms Flick. The most dramatic change has been for Ms Grimes, who has gone from four insulin injections a day to none and her sugar level readings have dropped from 17 to between six and seven. “My doctor, he couldn’t be happier either — he couldn’t believe when I’d take my little book in and show him my readings,” she said. Ms Flick asked him to come to Bourke after seeing him speak at a National Aboriginal Community Health Organisation conference. “A lot of health professionals in the country still believe type two diabetes isn’t reversible or that you can’t go into remission,” said Mr Kelly. He said his program, tailored to suit the lifestyle and culture of the Bourke participants, was not claiming to cure the disease but manage the impacts. “We say remission rather than cure because once people put weight back on, especially around the liver and pancreas area, they will get diabetes again so it’s a bit like cancer in that respect,” he said. These monumental wins for the two women were small by comparison to battles others still face. Aboriginal and Torres Strait Islander people were almost four times more likely than non-Indigenous Australians to have diabetes, according to Diabetes Australia. That’s little comfort for those who have it. Nor are figures from a 2016 Grattan Institute report showing only a quarter of the nearly one million Australians diagnosed with type 2 diabetes get the monitoring and treatment recommended for their condition. Disease specialist Professor Paul Zimmett said despite a world class reputation for treatment and management of the disease, more needed to be done. The Monash University professor of diabetes co-chaired a national diabetes strategy advisory group in 2014 and is Victoria’s Senior Australian of the Year. Professor Zimmett acknowledged Australia’s medical care of the disease was equal to anywhere in the world, but there were remote and rural areas who weren’t benefitting because of a lack of resources. “If you can prevent many complications of diabetes, kidney disease, eye disease, the need for dialysis, there’s huge cost savings,” he said. He said he was disappointed the government failed to implement many of the group’s recommendations, including the need for longitudinal studies. “To monitor the risk factors and new cases and deaths from diabetes, heart disease and kidney disease so that we actually know what is happening with the money that is pouring in for prevention,” he said. The Federal Government might be hesitating, but not so Professor Alex Brown, team leader of Aboriginal Health Research at the South Australia Health and Medical Research Institute, who is three years into a comprehensive study of Aboriginal and Torres Strait Islander communities. “We hope to recruit about 4000 people to track over years to understand what the causes of diabetes, and the complications of diabetes are,” said Professor Brown. The study involves initial screening including eyes, hearts and kidneys and then annual follow ups. 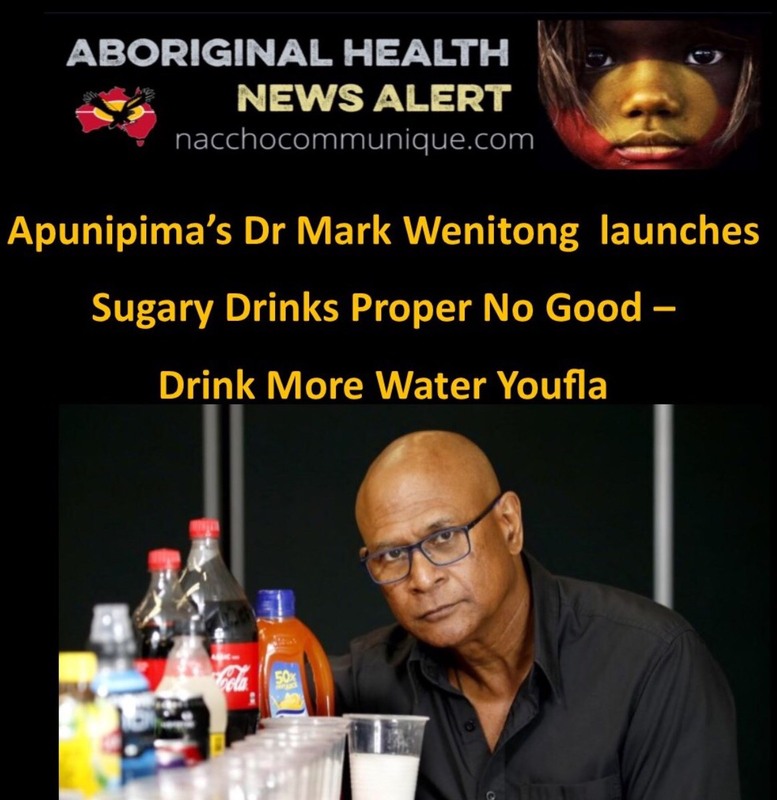 “This could answer things about the development of diabetes in Indigenous populations here in Australia,” he said. 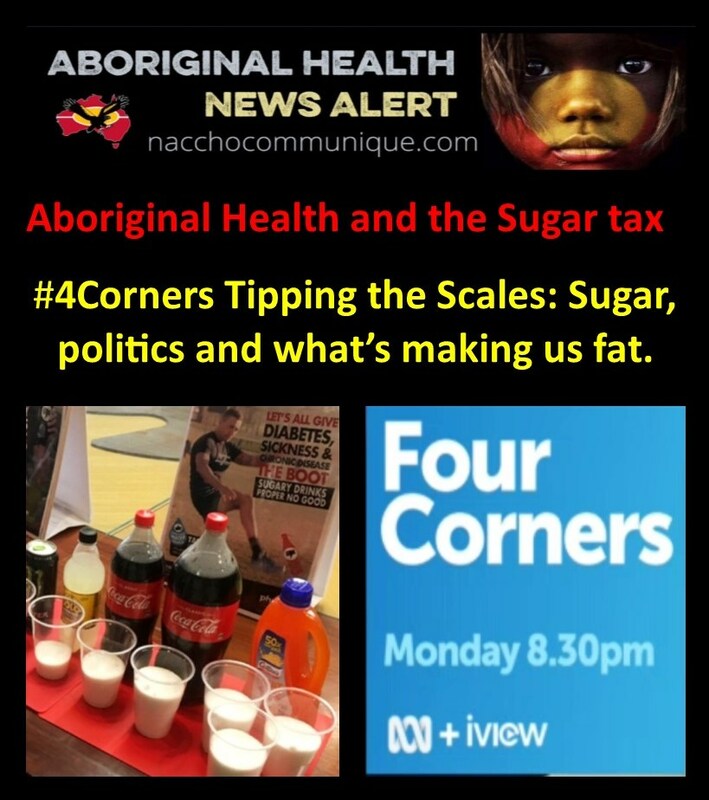 On Monday night Four Corners investigates the power of Big Sugar and its influence on public policy. The figures are startling. Today, 60% of Australian adults are classified as overweight or obese. By 2025 that figure is expected to rise to 80%. 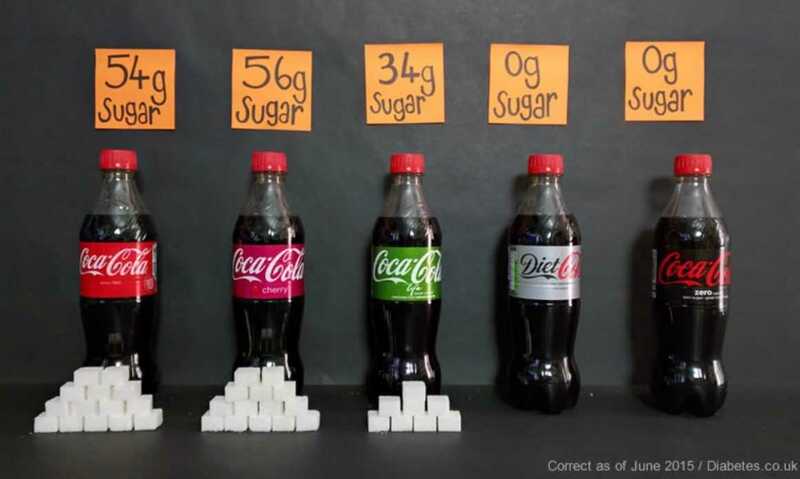 Many point the finger at sugar – which we’re consuming in enormous amounts – and the food and drink industry that makes and sells the products fuelled by it. Tipping the scales, reported by Michael Brissenden and presented by Sarah Ferguson, goes to air on Monday 30th of April at 8.30pm. It is replayed on Tuesday 1st of May at 1.00pm and Wednesday 2nd at 11.20pm. It can also be seen on ABC NEWS channel on Saturday at 8.10pm AEST, ABC iview and at abc.net.au/4corners. “Amata was an alcohol-free community, but some years earlier its population of just under 400 people had been consuming 40,000 litres of soft drink annually. NACCHO Post : Mai Wiru, meaning good health, and managed by long-time community consultant John Tregenza. 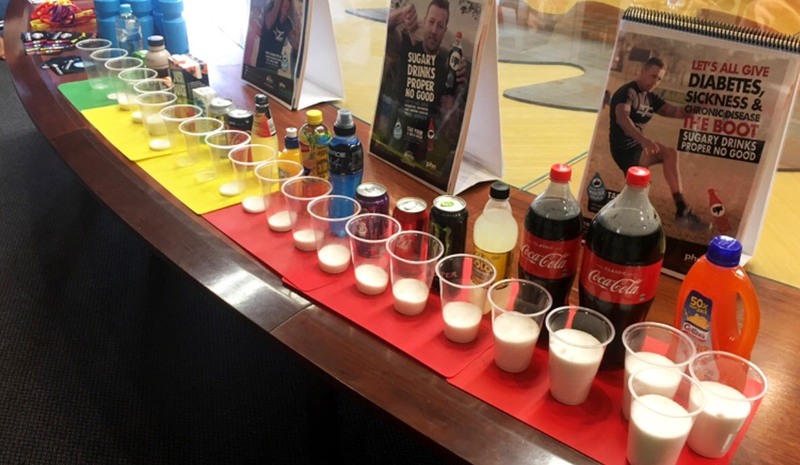 Despite doctors’ calls for urgent action, there’s been fierce resistance by the industry to measures aimed at changing what we eat and drink, like the proposed introduction of a sugar tax. 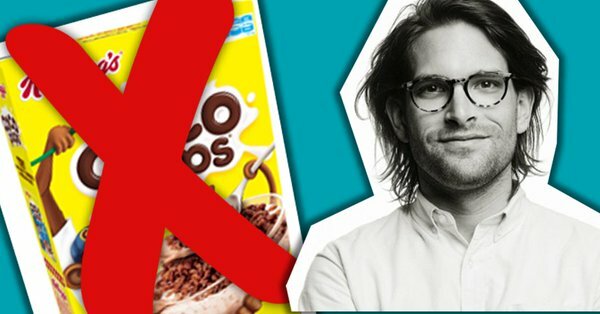 From its role in shutting down debate about a possible sugar tax to its involvement in the controversial health star rating system, the industry has been remarkably successful in getting its way. We reveal the tactics employed by the industry and the access it enjoys at a time when health professionals say we are in a national obesity crisis. 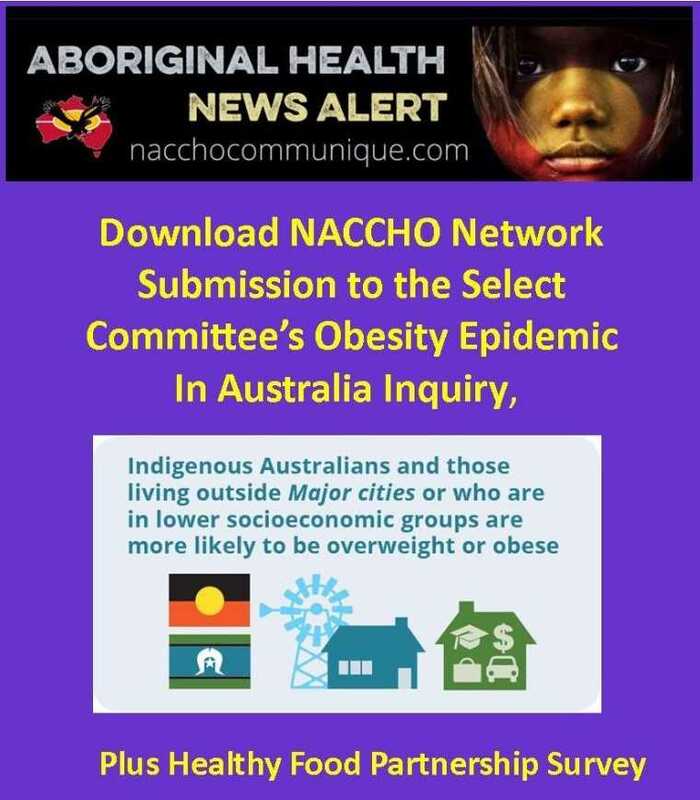 NACCHO post – Sixty-three per cent of Australian adults and 27 per cent of our children are overweight or obese. 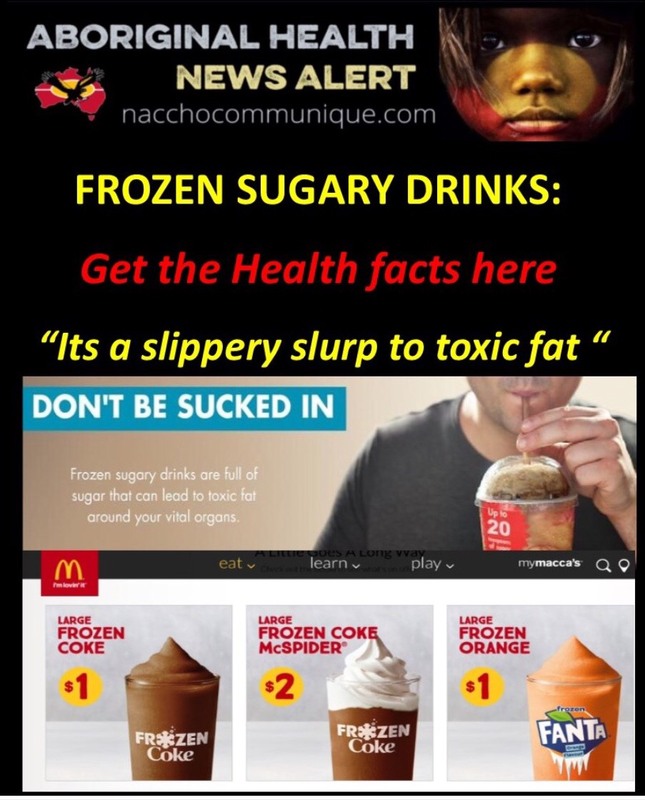 “This is not surprising when you look at our environment – our kids are bombarded with advertising for junk food, high-sugar drinks are cheaper than water, and sugar and saturated fat are hiding in so-called ‘healthy’ foods. Making a healthy choice has never been more difficult. 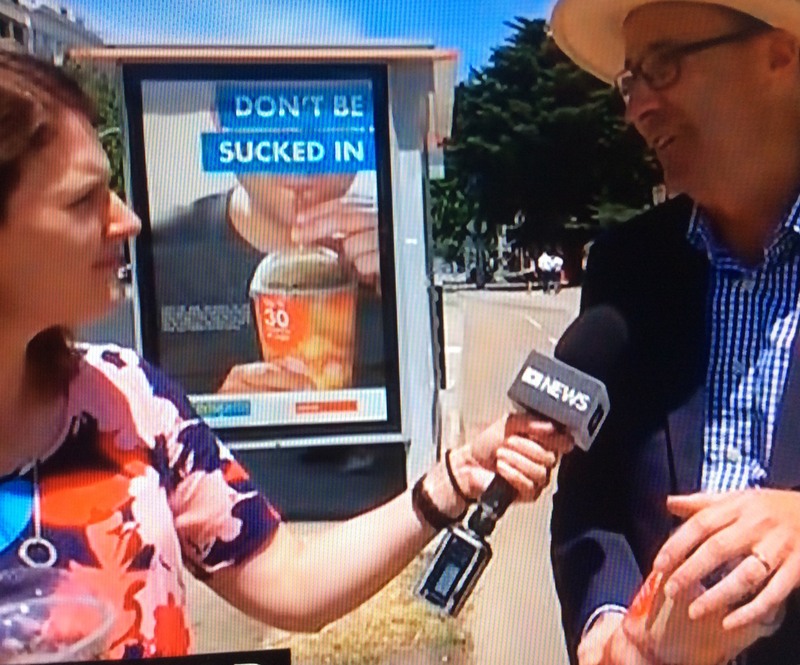 “A cheeky, graphic counter-campaign taking on cheap frozen drink promotions like $1 Slurpees and Frozen Cokes has hit Victorian bus and tram stops to urge Australians to rethink their sugary drink. 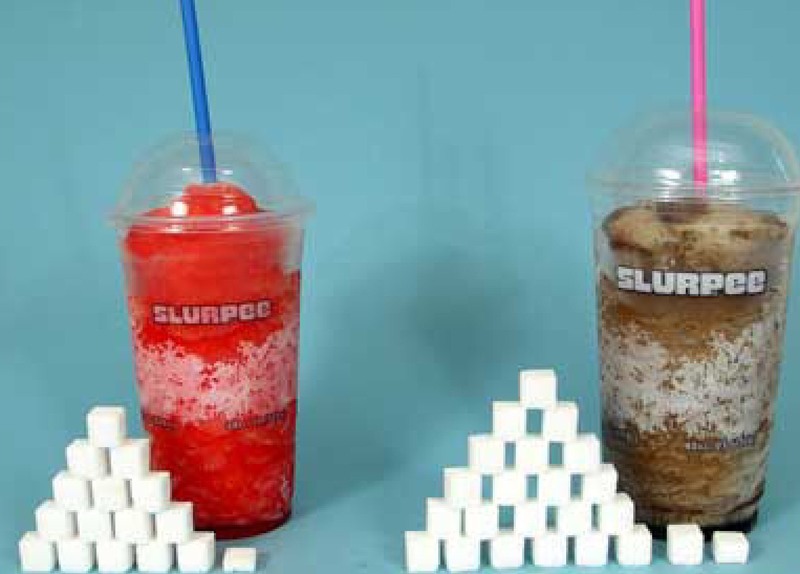 “A mega $3 Slurpee contains more than 20 teaspoons of sugar. 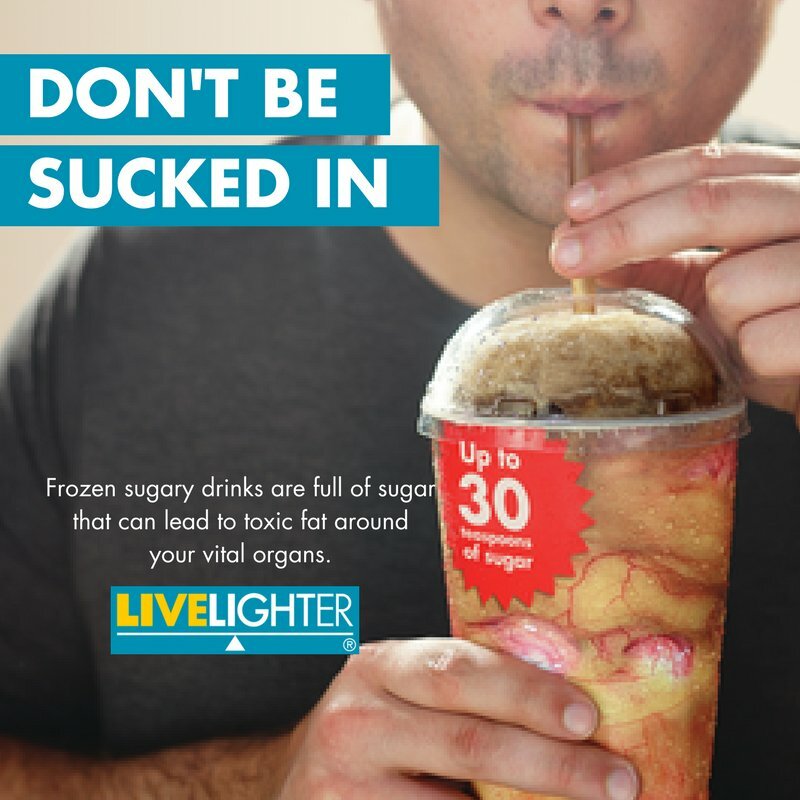 About LiveLighter: LiveLighter® is a public health education campaign encouraging Australian adults to lead healthier lives by changing what they eat and drink, and being more active. In Victoria, the campaign is delivered by Cancer Council Victoria and Heart Foundation Victoria. In Western Australia, LiveLighter is delivered by Heart Foundation WA and Cancer Council WA. About Rethink Sugary Drink: Rethink Sugary Drink is a partnership between the Apunipima Cape York Health Council, Australian Dental Association, Australian Dental and Oral Health Therapists’ Association, Cancer Council Australia, Dental Health Services Victoria, Dental Hygienists Association of Australia, Diabetes Australia, Healthier Workplace WA, Kidney Health Australia, LiveLighter, The Mai Wiru Sugar Challenge Foundation, Nutrition Australia, Obesity Policy Coalition, Stroke Foundation, Parents’ Voice, the Victorian Aboriginal Community Controlled Health Organisation (VACCHO) and the YMCA to raise awareness of the amount of sugar in sugar-sweetened beverages and encourage Australians to reduce their consumption. 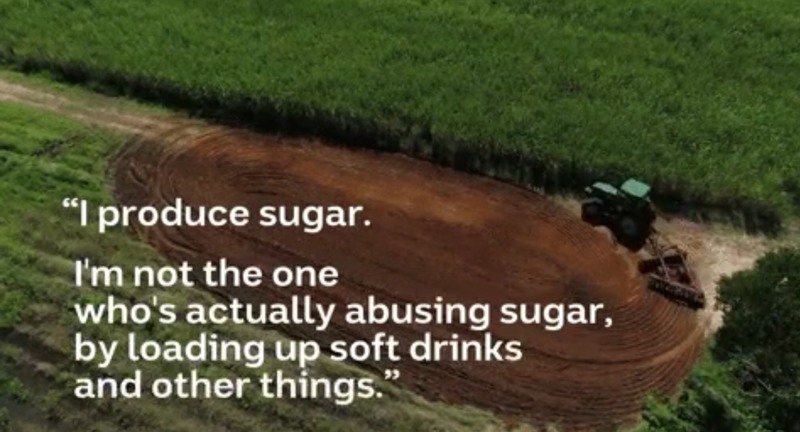 Visit www.rethinksugarydrink.org.au for more information.